ALTHOUGH OUR 4YO knows the difference between a TV and a tablet, her viewing preferences are lap-based. 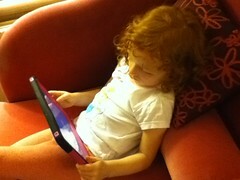 Mia knows her way around interfaces on iPads and other iOS devices, Xoom Media Players, Windows phone and DVD menus. If Saorview, the new digital terrestrial service, had icons for programmes, she could easily find her way around the DTT and radio channels. But our four year old's normal digital viewing position is cradling a tablet in her lap or viewing it as it sits in a stand on the table. Five hours a week she has a tablet in the back seat of the car, sometimes yapping on playlists served by the Mifi dongle on the dashboard. This is a media consumption pattern that I would not have predicted in Ireland when I first stated my online journal in the late 90s. I'm going to start asking Mia to share her thoughts about how she finds and consumes multimedia. I am very intrigued by what touch points she sees in her media landscape. Bernie Goldbach tracks info to present at EdTech events.